‘A grumpy yet loveable man finds his solitary world turned on its head when a boisterous young family moves in next door. This was our last book club meeting before breaking for the summer. 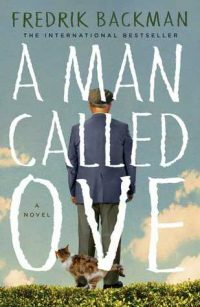 A Man Called Ove is the perfect pre-summer book! We all loved this beautifully told story filled with warm, engaging characters that made us laugh and made us cry. The dialogue was fantastic. Whether it was Ove at his wife’s graveside, Ove and his very pregnant, obtrusive neighbor, Ove and the Weed, or Ove and the cat… Wonderful. Although this is a very funny book, the cast of characters, …cats and …cars is well developed. Each of them has a personality and relationship with Ove all their own. Such a great read!! Thanks to our host for the munchies and the great post-book discussion! From politics to proms… we didn’t figure out the answers but the venting was fun.